With thirty years of college English teaching experience and many, varied, publications, including a popular memoir, Baltho, The Dog Who Owned a Man, two books of poetry, an acclaimed scholarly work, and a novel on the way, I am used to working with all kinds of writing and writers, from basic to advanced. I have taught business and technical writing, expository writing, and creative writing mostly at the university level (but some at high school as well). For help you can email me your writing, from reports, to emails, to resumes, to creative work. I also offer individual in-person tutorials, with prompt suggestions for improvement so that you are guided to become better, more proficient, and confident in your skills. You can invite me into your workplace, where I can present interactive writing seminars for your staff. If desired, such help can be combined with various other kinds of business, personal, or executive coaching. I have started my own publishing company, Barn Swallow Media, after having all sorts of adventures with publishing my works–agents interested, but then not, publishing companies interested but then not. Sometimes the reason was lost funding or changing markets. Sometimes I was offered poor contracts. And so on. It seemed that I could get old and die before I finally found a suitable publisher after all those years of searching. Which is hard work–and very time-consuming. Because many people are writing and hoping to publish their works, I’m offering to help you publish your books through my publishing company. I can help with editing, layout, cover, printing, distribution, publicity, etc. You’ll be able to keep more of your own royalties than you would be able to do if you went through other venues. Because you’ll have professional help with every step of the process so you will be proud of your finished product. If you prefer, you are free to publish through someone else. For a full biography of me and more information on fees, click here. You decide how much of my time to buy and the exact nature of my help, as various packages can be designed. I am a writer of non-fiction, fiction, and poetry. Nominated for Poet Laureate of Colorado, I have published creative and scholarly works in a number of nationally circulated magazines and journals. I have also published a series of magazine/newspaper articles on psychological, sexual, and spiritual integration. My exciting new novel, Reading the Signs: A Paranormal Love Story, is just out. You can buy signed copies directly from me. It’s also available in Kindle and Paperback from Amazon.com. Soon you will be able to get it at other outlets. Although inspired by actual events and characters, certain elements are fictionalized. However, the protagonist’s experiences as a university professor and an Episcopal campus chaplain are very close to my own. So are the paranormal happenings, many of which are echoed in my more clearly autobiographical book of poetry, Love Strings. PLEASE NOTE: IF YOU LIVE OUTSIDE THE U.S. IT’S VERY DIFFICULT TO GET YOU A SIGNED BOOK BECAUSE POSTAGE IS PROHIBITIVE. I’VE BASED THE S&H ON U.S. PRICES (MEDIA MAIL). IF YOU LIVE IN THE UK, WHERE S&H ARE ONLY A COUPLE DOLLARS MORE, AND WANT AN UNSIGNED COPY, I CAN ABSORB THE S&H AT THE RATE FOR AN UNSIGNED COPY BELOW. IF YOU LIVE ANYWHERE OUTSIDE THE U.S. AND WANT A SIGNED COPY, I WOULD URGE YOU TO ORDER YOUR BOOK ON AMAZON. THEN, ORDER A SIGNED ADDRESS LABEL OR TWO BELOW. I ASK BECAUSE OF PROHIBITIVE SHIPPING COSTS AND BECAUSE I DON’T WANT TO BE TOO MUCH IN THE MIDDLE. PAY PAL ALSO SUBTRACTS A FEE. IF YOU LIVE OUTSIDE THE U.S. AND WANT A SIGNED COPY OF THE BOOK, AND DON’T MIND PAYING THE NECESSARY POSTAGE, EMAIL ME AND WE’LL MAKE ARRANGEMENTS. Buy signed paperback copy (1-3) of Reading the Signs: A Paranormal Love Story. $15.00 USD, 2 for $30 USD or 3 for $44 USD. CURRENT SPECIAL: IF YOU LIVE IN THE U.S. I WILL SEND YOU A SIGNED COPY OF THE BOOK(S) FOR THIS PRICE. BE SURE TO TELL ME WHAT YOU WANT ME TO SAY WHEN YOU ORDER. I’ve dropped the price from 16 to $15 for a single copy because the shipping and handling is $5, whether you buy 1 or 3 books. On John Milton’s use of traditional sign theory and typology in Paradise Lost, titled, Perversions, Originals, and Redemptions in Paradise Lost, was published by the University Press of America. “The remarkable achievement of this manuscript is to explicate how signs are evident in the very language of the epic, how, that is, the very language is informed with significance. The book develops a sign theory with reference to Paradise Lost in exciting and new directions. No other study, to my knowledge, is as comprehensive and systematic and detailed in doing so. The research is extensive, the citations from secondary resources are apt, and the contributions in original thinking and interpretations are extraordinary.” Albert C. Labriola, Professor of English and Distinguished University Professor, Duquesne University; Editor of Milton Studies; and Honored Scholar of the Milton Society for 2000 Read Professor Labriola’s Foreword by clicking here. Baltho, The Dog Who Owned a Man (click on title to read first three chapters and endorsements), the first in a three books series about my extraordinary experiences with dogs and cats that have come into my life. These animals have helped with my counseling, not just as typical therapy animals, but as co-therapists that point out things I may have missed without their intuitive insight. If you become a counseling client, you will learn firsthand how these animals work to reveal problems and suggest solutions. This book centers on the extraordinary story of my rescued Afghan Hound, Balthazar, or Baltho, my co-therapist. He pointed out problems that I had missed in counselees and helped us find solutions much faster than I ever would have without his help. We shared a psychic bond that has endured even though his body died and has returned twice to me–next in Hattie, and now again in the dog she/he said wants to be known as Melchior, another of the Three Wise Men. I’m sure he’s planning to take up the mantle of co-therapist dog once again. PLEASE NOTE: IF YOU LIVE OUTSIDE THE U.S. IT’S VERY DIFFICULT TO GET YOU A SIGNED BOOK OR POSTER BECAUSE POSTAGE IS PROHIBITIVE. I’VE BASED THE S&H ON U.S. PRICES (MEDIA MAIL). IF YOU LIVE OUTSIDE THE U.S. AND WANT A SIGNED COPY OF THE BOOK OR POSTER, AND DON’T MIND PAYING THE NECESSARY POSTAGE, EMAIL ME AND WE’LL MAKE ARRANGEMENTS. Buy 1 signed paperback of Baltho, The Dog Who Owned a Man. $15.00 USD. CURRENT SPECIAL: IF YOU LIVE IN THE U.S. I WILL SEND YOU A SIGNED COPY OF THE BOOK FOR THIS PRICE. BE SURE TO TELL ME WHAT YOU WANT ME TO SAY WHEN YOU ORDER. Buy 2 signed paperback copies of Baltho, the Dog Who Owned a Man. $29.00 USD. CURRENT SPECIAL: IF YOU LIVE IN THE U.S. I WILL SEND YOU SIGNED COPIES OF THE BOOK FOR THIS PRICE. BE SURE TO TELL ME WHAT YOU WANT ME TO SAY WHEN YOU ORDER. Buy 3 signed paperback copies of Baltho, The Dog Who Owned a Man. $42.00 USD. CURRENT SPECIAL: IF YOU LIVE IN THE U.S. I WILL SEND YOU SIGNED COPIES OF THE BOOK FOR THIS PRICE. BE SURE TO TELL ME WHAT YOU WANT ME TO SAY WHEN YOU ORDER. My first book of poetry. My first book of poetry, The Necessity of Symbols, is now available. Working within The Great Western Tradition the emphasis is upon spiritual growth in poems that are sensual, insightful, and profound, accessible to most readers. to the simple and unified truth of the spiritual vision. on the roof like round, grey pebbles. At noon the sky cleared to a translucent lapis. the sun a bright, gold alpha. I thought of my students’ exercises in poetry. a chubby-handed toddler, to Washington Park. white, and brown, and mottled. We felt like children ourselves. until by love all returns to one again. I turned and lay on my stomach. and ran into my eye. Stinging light, refracting, the bead multiplied. quickly on the heme-baked bricks below. 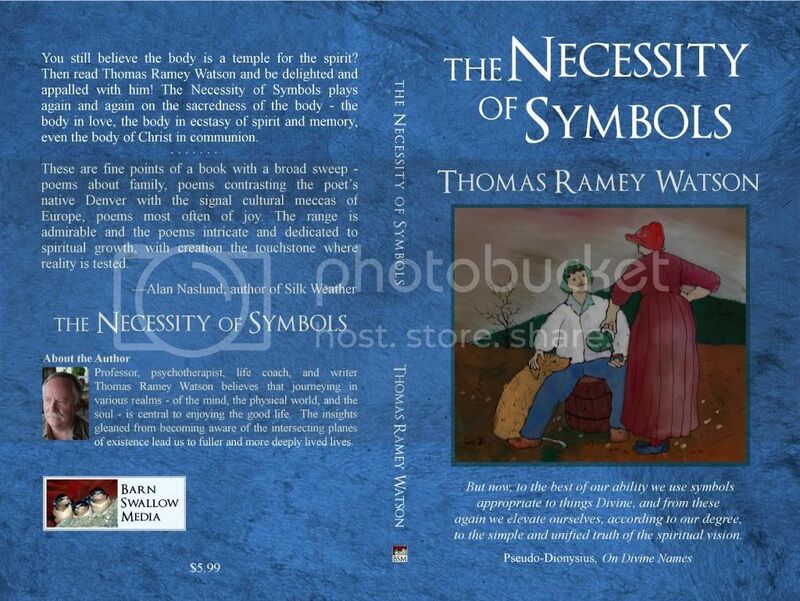 Buy 1 signed paperback of The Necessity of Symbols. $6.00 USD. CURRENT SPECIAL: IF YOU LIVE IN THE U.S. I WILL SEND YOU A SIGNED COPY OF THE BOOK FOR THIS PRICE. BE SURE TO TELL ME WHAT YOU WANT ME TO SAY WHEN YOU ORDER. Buy 2 signed paperback copies of The Necessity of Symbols. $10.00 USD. CURRENT SPECIAL: IF YOU LIVE IN THE U.S. I WILL SEND YOU SIGNED COPIES OF THE BOOK FOR THIS PRICE. BE SURE TO TELL ME WHAT YOU WANT ME TO SAY WHEN YOU ORDER. Buy 3 signed paperback copies of The Necessity of Symbols. $14.00 USD. CURRENT SPECIAL: IF YOU LIVE IN THE U.S. I WILL SEND YOU SIGNED COPIES OF THE BOOK FOR THIS PRICE. BE SURE TO TELL ME WHAT YOU WANT ME TO SAY WHEN YOU ORDER. My new book, Love Threads, records in poetry a series of experiences mostly in the realm of the soul that I had for over a year in the late 1990s. In its way it reflects and serves as a tribute to Donne, Herbert, Vaughan, Milton, Blake, Wordsworth, and various mystics, including those of other traditions, who have been my mentors. Here is an excerpt from the Foreword, The Point Where All Begins and Ends:Love Threads can be a painful book because it is about a hurtful relationship, but more important, it is a clear call to love and to love even when there is difficulty. A clear call to love spiritually and in body. It is essentially a transcendent calling, an ecstatic one—and a genuine journey of love. These are poems whose obscurity win their way graciously with resonances that wistfully suggest sweetness and light without identifying many specifics or concrete manifestations of the sacred other. These poems make up invocations that appeal through the plausible and very humane nexus of dream, or vision, and longing. Continual hope for something solid that never appears or makes itself known in features that are not quite enough to satisfy a strong undercurrent of almost ambiguous desire. The poet makes clear his romantic trajectory in the early poems. It is not long before most readers will know where they are, as long as we are amenable to some real ambiguities of image and style. The title, “Beta” of the opening poem, seems to denote, as in physics, a variable, the speaker’s other coruscating from the first words of the book. The secrets of the ultimate temple of old Israel, radical, personal renewing in this world, a glass house, another garden, even a revisiting of Tao—the windup poems of this collection pull toward a general summation of spirit. . . . The world is as it has been in the rest of the book, but it is rather left behind—caught up in greater concerns. In some sense, these more expansive spiritual realms are also higher than the dear but desperate strife of the journey of the troubled relationship itself. They are the Alpha from which the entire journey begins. And where it ends. Buy 1 signed paperback of Love Threads. $6.00 USD. CURRENT SPECIAL: IF YOU LIVE IN THE U.S. I WILL SEND YOU A SIGNED COPY OF THE BOOK FOR THIS PRICE. BE SURE TO TELL ME WHAT YOU WANT ME TO SAY WHEN YOU ORDER. Buy 2 signed paperback copies of Love Threads. $10.00 USD. CURRENT SPECIAL: IF YOU LIVE IN THE U.S. I WILL SEND YOU SIGNED COPIES OF THE BOOK FOR THIS PRICE. BE SURE TO TELL ME WHAT YOU WANT ME TO SAY WHEN YOU ORDER. Buy 3 signed paperback copies of Love Threads. $14.00 USD. CURRENT SPECIAL: IF YOU LIVE IN THE U.S. I WILL SEND YOU SIGNED COPIES OF THE BOOK FOR THIS PRICE. BE SURE TO TELL ME WHAT YOU WANT ME TO SAY WHEN YOU ORDER. and Baltho with his cat Figaro, or Figgy. Both are mentioned in Baltho, The Dog Who Owned a Man. 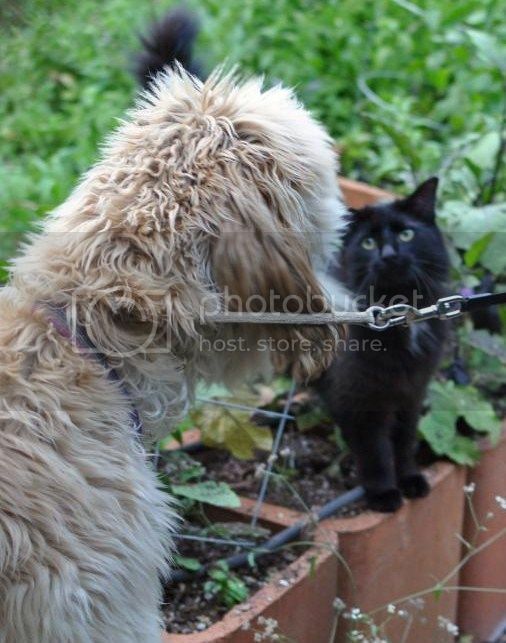 And below is Melchior with his pal who was once known as Figaro/Figgy, now back again and known as Noir. Without justice, not just for one but for all–not only the powerful, but the disenfranchised, those without voices, the poor in spirit and material goods–there can be no real or lasting peace.